While the .357 SIG is one of the more uncommon rounds being carried today, it has long ago earned its place as one of the most effective and lethal handguns rounds commonly carried by police and concerned citizens today. Winchester’s 125 grain FMJ .357 SIG ammo has a propensity for performance, and a price point that you can afford to shoot with little mental reservation. 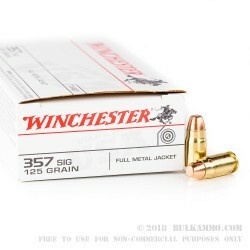 The Winchester 125gr FMJ .357 SIG is unique due to the cartridges inherent design. 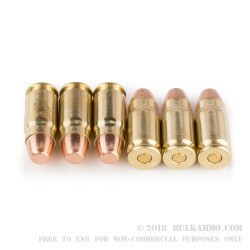 Originally a .40 cartridge necked down to chamber a 9mm bullet, the .357 SIG is the best of both worlds in term of both bullet velocity and shear stopping power. The flat nose round point design of the the Winchester 125gr Full Metal Jacket .357 SIG makes for an exceptionally blunt surface capable of causing sustained crushing injuries throughout the permanent cavity. At an astounding muzzle velocity of 1,350 feet per second, the Winchester 125gr Full Metal Jacket .357 SIG is capable of penetrating even the hardest of intermediary surfaces on its flight path to the intended target. 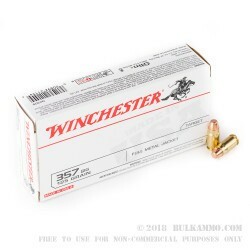 Law enforcement officers and American patriots in search of a round for greater self defense can carry no greater, concealable round than The Winchester 125gr Full Metal Jacket .357 SIG. Another good purchase from Bulk Ammo has arrived today. I have purchased some Winchester 357 SIG ammo, and was packaged securely for a relatively good price. 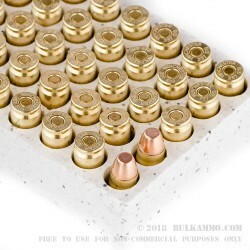 This is not my first purchase from Bulk Ammo, and is surely not my last.